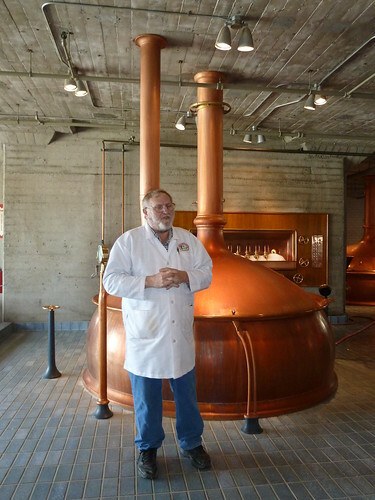 Today is the 70th birthday — The Big 7-O — of Bob Brewer, longtime brewery rep. for Anchor Brewing. For many years, he worked from southern California, circling the country with the entire nation his territory (the only exception being the Bay Area) representing Anchor beers. More recently, he moved back to the Bay Area, but you could find him at every nook and cranny of the beer world. 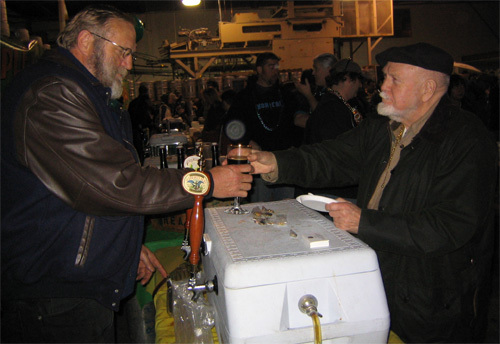 A couple of years ago, Bob retired from Anchor, although he still occasionally works a festival or does other work, like giving a great talk at my class at SSU and more recently he was working the taps for Anchor at the Lagunitas Circus. Join me in wishing Bob a very happy birthday. 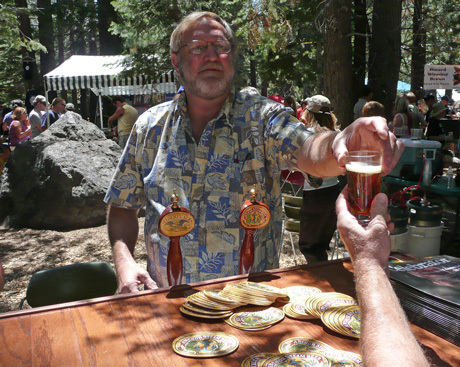 Bob serving a festival-goer at the Mammoth Lakes Bluesapalooza in 2007. Bob giving a tour at Anchor. Bob serves up the then-new Anchor Bock to Portland beer sage Fred Eckhardt. 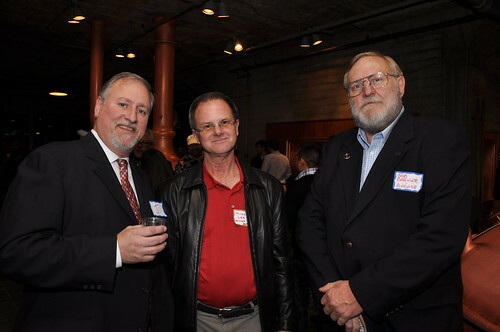 Me, brewer Mike Lee and Bob at the 2011 Anchor Christmas party. I had a wonderful conversation & tour with Bob at Anchor on Monday. He’s a wonderful representative of a remarkable product. Have a tall one Bob!!! Great guy who’s always willing to chat @ beer events – Rory’s 2nd sentence hit it right on the head! The Brew Shop and Platypus Pub. Happy bday Bob!!!! It is always fun to see you and chat at beer events like the CA State Homebrew Comp and Dinner, Beer Festivals and the awesome beer and spirits event last year at Thirsty Bear. Our friends overseas loved all the pins you gave me. Thanks so much for all you do for the homebrewers. Loved the tie of clubs this year! I know you and Bruce do most of it and we all thank you! Happy bday Bob!!!!! Hope you have another wonderful year and hope to see you at SF Beer Week, always fun to chat with you. Sorry we missed the CA State Homebrew Comp, maybe next year. Happy Birthday Bob….I had the pleasure of a private tour of the Anchor Brewery by Bob ealier this year. And it wasn’t a …”let me show you the place kind of thing” it was a full on 2-3 hours we spent together. As I told him…I miss seeing him working the trade in HAWAII. Yes, he did cover the entire country. Hope you have a beery good bday!!!!! Hope to see you during beer week. He’s 3 months & 13 days older than me – our next PRIME # birthday is 71 – from there, the goal is to reach the next ones (73.79, 83, 89, 93, 97) Should be lucky enough to hit the C-mark, then we get 4 more (101, 103, 107, & 109). For however many primes we hit going forward, may we always be able to have at least one good beer with which to celebrate! Feliz cumpleanos Bob (a few days late) – may you have many more! Somehow the “we” got lost/not entered before “be lucky…” My bad for not proofing before the post. Hope you’re enjoying a well deserved retirement Bob!!!! And have a wonderful beerday!!!!! Take care. Cheers! We sure miss seeing you around Bob! Hope you’re having a great beertirement. Hoppy Beerday! Hoppy Beerday Bob!!!! Sure miss seeing you around. Maybe at a SF Beer Week event. Hope you’re enjoying your well deserved retirement!!! !